Enrico 10 mánuðir, 2 weeks síðan. Together with a couple of friends I’m planning to come to Iceland the next august to make a selfsupported Vatnajokull traverse. We all have extensive experience of the alpine enviroment and of remote areas trips, this is why we are not looking for an organized/guided tour. – concerning the transportation to and from the glacier, we got some „stellar price quotation“ that are absolutely not affordable for us, so we can compromise the itinerary in order to start and end the traverse in the proximity of the ringroad. frome the satellite images we have identified a possible path that would start from the Joklasel hut and end on the Skaftafellsjokull. The glacier access from the hut seems to be rather easy (is that true?) while the descend from the Skaftafellsjokull seems much more demanding because of a long highly crevassed section. Would you think that it’s possible to safely descend the skaftafellsjokull? -The abobe mentioned trip length should be around 80/90 km…enven though less confortable than the cross country skiis, do you think that the itinerary is also feasible with larger/ heavier ski touring equipment? 1. Starting an expedition on Skálafellsjökull is a good idea. You can reach snow there relatively easily in the summer. 2. The access to Skálafellsjökull is easy, but there is no public transportation that leads to the hut. So you need to get someone to give you a lift to there. 3. Going down Skaftafellsjökull is a out of the question in August. Big crevasses. 4. If you want to go down directly to the road nr.1 then you can try go down the Sandfell route on Öræfajökull or the route down past the Vestari-Hnappur, also on Öræfajökull. Both of these routes demand carrying all the gear downhill for many hours after you get of the snow. They also have significant crevasses in August, but not as much as on Skaftafellsjökull. So if you like suffering under heavy loads, then these routes might work for you. 5. Other option for exiting the ice cap is to go down Breiðamerkurjökull. Although you will be on hard glacier ice for quite some time walking down the glacier. 6. Third option is to continue west and aim for the hut on Grímsfjall. Note that you have to make a reservation at jorfi.is. Then go down Tungnaárjökull and have someone to pick you up at the edge of the glacier. That might be expensive. 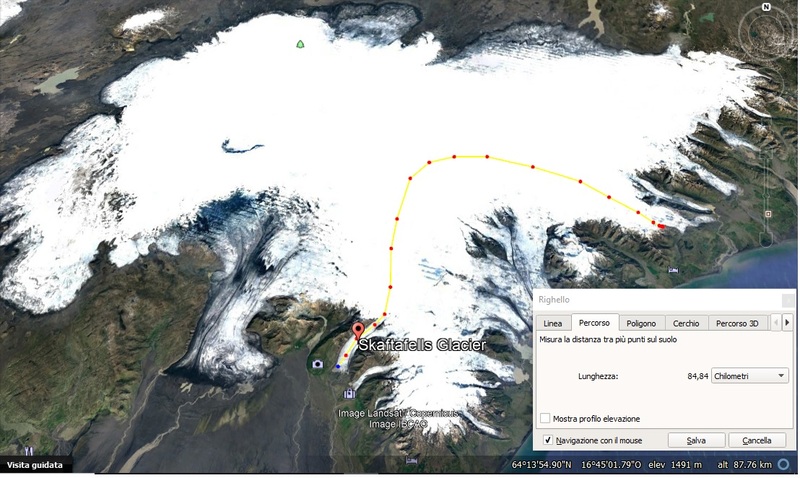 This is a common route over Vatnajökull these days, about 120-130 km in total. 7. Another option is to head north, aim for Kverkfjöll mountains and go down to the hut in Kverkfjöll. There might be a bus that goes to Kverkfjöll in the summer but I’m not sure. 8. You can rent cross country skis in a ski shop called Everest (everest.is) and pulkas can be rented from Icelandic Mountain Guides. 9. Look up crevasse maps on safetravel.is . The red marked areas are very difficult to travel through in August and should be avoided. thank you so much for the very very usefull info!